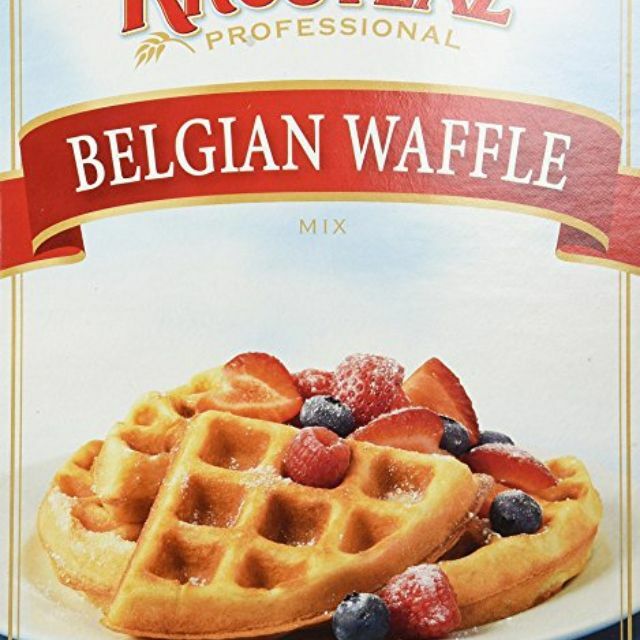 A foodservice waffle mix in a size that’s not outrageous for families who love waffles, this Belgian waffle mix will have you making breakfasts that are just as good as the ones from your local diner. And it couldn’t be easier, since eggs and oil are already part of the mix. All you need to do is measure the mix and add water! The larger size is cost effective per serving, but if this 5-pound bag is too large for your family smaller boxes are available. For a richer flavor, you can add extra oil or eggs. Fresh fruit can also be added for a dose of sweetness. If you're looking for classic flavor, this might be the same mix your mom used to make waffles and pancakes when you were a child. A versatile mix, this can be used to make either pancakes or waffles—the only difference is the addition of the oil for waffles. Whether it’s your favorite for nostalgia’s sake or you appreciate the ease of preparation, this is a favorite among buyers. This 5-pound box makes about 50 servings, and includes instructions for making large batches. 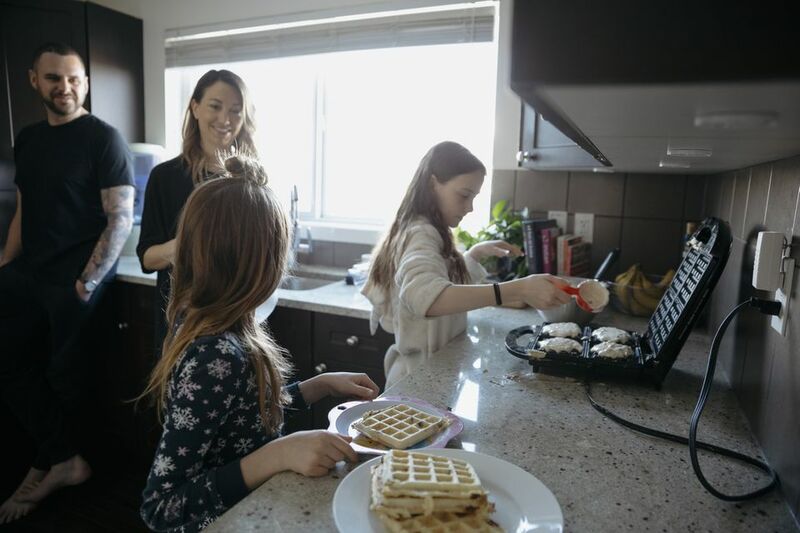 When waffles are a special treat rather than an everyday breakfast, this buttermilk pancake and waffle mix will help you make the most out of your morning. While not as simple as water-only mixes since you’ll need to add eggs, milk or buttermilk, and melted butter, these additions really boost the flavor. Even without the additions, this mix is absolutely delicious. This is a 16-ounce container, so you might want to keep a backup on hand! A familiar name and a versatile mix, you can use this for both pancakes or waffles so you can switch up your breakfast routine. For pancakes, just add water. Waffles require eggs and oil. This 32-ounce package is inexpensive enough for everyday breakfasts, whether you’re feeding the whole family or the neighbors are invited for brunch. If this was one of the brands your mom made for you, it’s a sure bet you’ll love the comforting flavor. Known for their wide variety of flours, grains, and baking ingredients, Bob’s Red Mill also makes waffle mix. This organic mix ticks all the health-conscious boxes, while still being packed with flavor. It’s USDA certified organic, vegan, kosher pareve, and made from whole grain flours so it’s high in fiber compared to mixes made from white flour. This box includes four 26-ounce bags, so you can open one and store the rest in the refrigerator or freezer for optimal freshness. As an added bonus, this mix includes additional recipes for making muffins and coffeecake. Bisquick was an innovative product when it was first introduced in 1931, and it still remains a staple in many homes. This gluten-free mix tastes delicious and doesn't contain any artificial flavors or preservatives, so it's a great choice for those with dietary restrictions. And like the original product, it can be used for pancakes, waffles, muffins, biscuits, coffeecake, shortcakes, and more! Similar to the other mixes on this list, you'll just need to add eggs, milk, and oil. This box contains includes 3 boxes of 16-ounce baking mix, so it will last for a long time. Kodiak Cakes first gained popularity when the company appeared on the TV show Shark Tank. They didn’t land a deal, but they went on to exceed their projected earnings and they’ve added significantly to their product line since that introduction. This cake mix is made from 100 percent whole grains and has 14 grams of protein per serving. The protein content can be increased by adding milk or eggs to the mix rather than just water. This buttermilk mix can also be used to make waffles, pancakes, flapjacks, or other baked goods. Besides being a whole grain product, this is all natural, non-GMO, and kosher. This includes three 20-ounce packages, so you’ll have plenty of mix when you're cooking for large groups. It can be difficult to find packaged mixes that are acceptable fo those who are egg and dairy free, as many products are manufactured in facilities that use those ingredients. For folks who have to be super-careful, this mix is a great option. And it’s super easy to make, since you just have to add water. Besides eliminating dairy and eggs, this is made in a nut-free facility, so it’s great for those with nut allergies as well. All ingredients are non-GMO verified and kosher. This includes two 16-ounce boxes, so you’ll have a spare in the pantry. Gluten free mixes aren’t hard to find, but they still contain grains, so they won't be suitable for those on a paleo diet. This mix is completely grain free (and it’s low carb), so it may appeal to anyone looking to increase their protein intake and reduce carbs. To make this, you’ll need butter or coconut oil and water. As a side note, this mix does include nuts and egg whites, so it’s not acceptable for vegans or those with nut allergies. This nine-ounce package makes about four waffles. Buckwheat is a dark-colored grain with an earthy, nutty flavor. In large quantities it can taste bitter, so this mix includes both buckwheat and whole wheat for a more flavorful and appealing taste. Before adding the necessary eggs, oil, and milk this mix is considered vegan so you can use it in vegan or vegetarian recipes. It's also kosher pareve. This 26-ounce package gives you plenty of mix to work with.